The Sunny Isles Beach in Miami offers several magnificent condominiums and luxury oceanfront residences to the condo buyers. These luxury condominiums of the modern era consist of several advanced features and offer a large number of luxury amenities and services. The luxury condominium, Jade Beach, is located in the heart of Sunny Isles Beach, directly on the white sands of Atlantic Ocean. This luxury condominium offers residents many amenities in a luxurious and comfortable beachfront lifestyle. 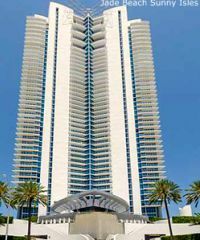 This majestic condominium is one of the most beautiful, desirable and popular condo towers in the Sunny Isles area. This imposing condo tower is 51-storey high and the appearance and structure of this condominium are stunning. World-famous designer and architect, Carlos Ott has designed this beautiful edifice. This luxury condominium consists of 248 spacious units, and all the units are beautifully designed and lavishly furnished. The magnificence and grandeur of Jade, Sunny Isles, attract the attention of the onlookers and visitors, and thoroughly impress the prospective condo buyers. If you want to buy a unit in this luxury condo tower, you can contact the well-known real estate companies that are offering the units of this condominium for sale. You may also visit the websites of these notable real estate companies to know more about the features and amenities of this luxury condominium. 9. The bathrooms have infinity-edge whirlpool tubs, European designer faucets and fixtures, etc. 10. The kitchens have Sub-Zero and Miele kitchen appliances, granite countertops, Snaidero wood and glass cabinets, etc. This condominium offers a luxurious resort-style living to the residents. The location and the remarkable residential features of this condominium, make it one of the best options for the condo buyers. Downtown Miami, Fort Lauderdale and all the other important areas in Miami are just a short drive away from this location, and thus, the residents can enjoy the glamorous city life, as well as relish the serene and blissful ambiance of the beach and the ocean.